Hertel All Purpose Concentrated Cleaner is ideal for cleaning large surfaces such as floors, walls and ceilings, and for making them shine. It also makes your job easier – there is no need to rinse or dry so it is almost effortless! 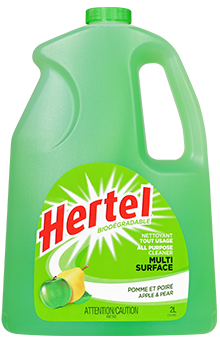 Biodegradable and phosphate-free, Hertel All Purpose Concentrated Cleaner leaves a fresh, clean scent throughout your home. A stroll through the orchard, a radiant day basked in sunlight. The softness of juicy pears combined with the freshness of crunchy green apples will bring back all the insouciance of childhood. Dilute 125 mL of Hertel All Purpose Concentrated Cleaner in 8 L of water. Apply with a well-wrung mop or cloth and wipe. There’s no need to rinse or dry. Use one of the Hertel All Purpose Concentrated Cleaner fragrances for your weekly cleaning. With their versatility and exhilarating scents, these products enhance the time you spend on this chore! To remind your children to take off their shoes before entering the room when you’ve just cleaned the floor, use one of the two Hertel All Purpose Concentrated Cleaner fragrances. The scent will let them know that the floor is freshly washed! 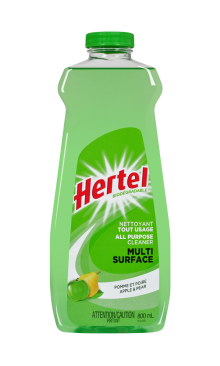 Use Hertel All Purpose Concentrated Cleaner, diluted in a bit of water in the sink, to clean and freshen your kitchen pantry and cabinets.